Scientists looking for life beyond Earth have a new target relatively close to home. The dwarf planet Ceres, which orbits in the Main Asteroid Belt between Mars and Jupiter, has organic compounds on its surface, a paper published in this week's Science shows. The discovery, made with NASA's orbiting Dawn spacecraft, follows earlier findings that the 590-mile wide Ceres may have an ocean beneath its frozen surface. 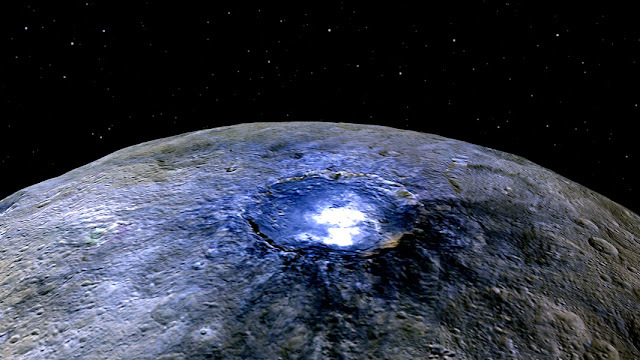 "There are speculations about a subsurface ocean on Ceres, similar to Europa or Enceladus," planetary scientist Michael Kuppers, with the European Space Astronomy Center in Madrid, told Seeker. Europa, a moon of Jupiter, and Enceladus, a moon circling Saturn, are two prime targets in the search for life beyond Earth. "These compounds are unlikely to have been delivered from an exterior source in an impact… because the extreme heat from an impact would have destroyed these types of compounds," Science wrote in a summary of the research. "If we consider Ceres to be typical of the planetesimals forming about 3 million years after day one of the solar system, the discovery indicates that the starting material in the solar system contained the essential elements… for life," Russell said.